Posted on March 27, 2013 by admin Posted in Uncategorized	. 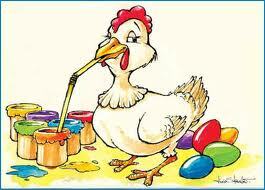 Picking The Right Wine For Easter Dinner! Posted on March 24, 2013 by admin Posted in Uncategorized	. 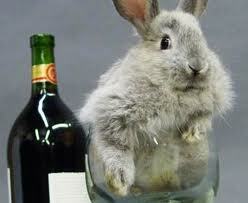 Wines That The Easter Bunny Will Love!!! 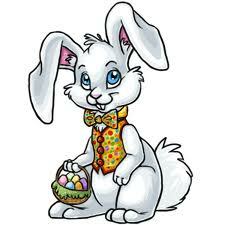 Well it’s Palm Sunday which means it’s time to hippity hop on down to your favorite wine shop and buy wine for Easter dinner. I know a lot of you go out for Easter but hey this will also help you know what to choose from the wine menu. 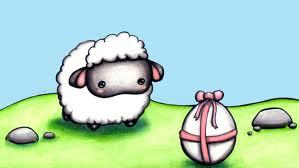 Now Easter means ham or lamb for most of us. I realize many of you may have other things such as beef or fish, but for this blog I’m going to concentrate on the two biggies. 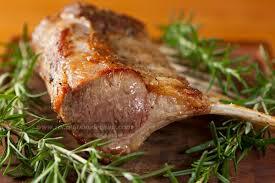 And since I don’t have lamb, I’m already stretching myself on this. Now let’s start with ham, which by the way is one of my favorite things to eat. I really do believe God gave man pork for our enjoyment. 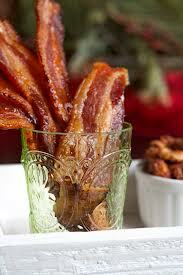 And hey everything tastes better with bacon! UMMMMM BACON…!! But I digress. Hams are salty due to the way they’re cured. Some are more salty than others. I once had a Virginia ham that made the Great Salt Lake seem like a normal waterway. So you need a wine that works well with the salty taste of ham. Add to that the fact that many hams are glazed with sugar or honey to help counter the salty taste. Glazed ham also fits in perfectly with the American past time of anything sweet. So if you want a white wine with your ham at dinner, I would go with a slightly sweet Riesling or Gewurztraminer. You’re looking for a wine that is fresh with a sweet fruitiness to balance the salt and a crisp acidity to support both the salt and the sweetness. Another alternative might be a slightly sweet and crisp Pinot Grigio or Pinot Gris. Remember they’re the same wine! As for reds, my first choice would be a fruit forward Zinfandel. They really go well with ham. An alternative would be Beaujolais. But if it was up to me, I go with a nice fruit forward Zin! 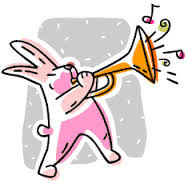 You can always go with Champagne/sparkling wine at Easter. They really do go well with foods, especially Brut Champagne & sparkling. However I’d go with an Extra Dry, they’re actually not as dry as Brut and are softer with more fruit. I especially like the ones made from red grapes like Pinot Noirs. And celebrating Easter is a great time to pull out the Champagne! 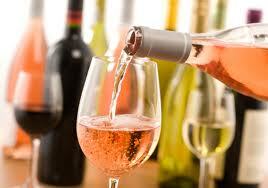 If you only want to serve one wine to meet the different tastes of your guests, why not try a Rosé. They’re light, crisp and flavorful and pair well with ham. A Zin Rosé should work well and I’m not talking about a blush White Zin! That’s for Pinky!! Now for Lamb, let’s talk red wine. Lambs have a gamey flavor, some more than others, but still gamey. These are really meant for red wines and this is a great time to bring out that Cabernet Sauvignon you’ve been saving. Cabs have the flavors, tannins and finish to stand up to the lamb. And one taste will remind you that they truly are the king of wines! 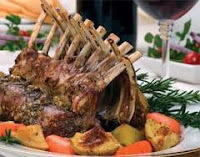 If your lamb has a medium gamey taste you might go with a Malbec or Shiraz. In fact this might be a great time to try one of Texas’ really nice Tempranillos. And with lighter less gamey Lamb dishes you can go with a very nice Pinot Noir, which usually means expensive! 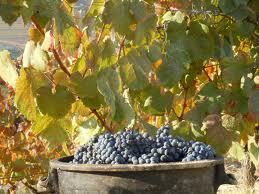 Remember the goal is a red wine with good fruit that has decent tannins and finishes well. You want it to stand up to the lamb but not overpower it! Now hop on down that bunny trail and go look for that perfect wine for your Easter dinner! The Neighborhood Wine Porch Party!!!! You can now follow The Neighborhood Wine Porch Party on Facebook where this blog appears weekly as well as listings for wine events, recipes and additional wine information. While on the page, please take the time to “Like” it and share it with your friends. You can also follow the blog and my comments about wine on Twitter @winegonewild. Also please add your comments below & take the time to “join our blog” on the top right hand side of this page. You don’t have to live in Munger Place to join the blog or like us on facebook. Posted on March 20, 2013 by admin Posted in Uncategorized	. Posted on March 16, 2013 by admin Posted in Uncategorized	. Excuse Me But I’m Still looking For That Perfect Port!! This is my second and last installment on Ports. I guess I got carried away because the blog became so long I had to break it into two posts. Oh well a good Port is worth it even if the blog’s a little boring! Ok a lot boring, but you’ll thank me the next time you want to buy a Port for that important dinner. You’ll at least know what you’re looking at and that’s a good thing…right? So here are the last of the types of Ports you’ll find out there! 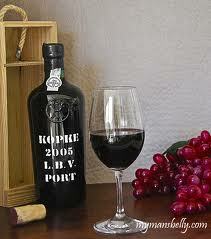 Late-Bottled Vintage Port (LBV) – These wines are ready to drink once they are released. They’re good wines blended from a single vintage, but often not from a great year. These Ports are aged in wood for 4 to 6 years after harvest before being bottled. 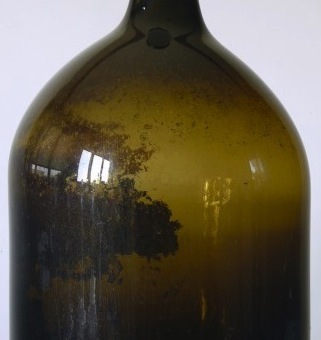 The year of bottling is often noted on the bottle, so the longer it’s aged in wood the better. 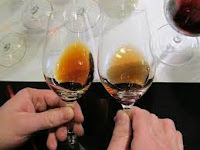 Their color is lighter than Vintage Ports but they will have many of the same complex characteristics, aromas and flavors. Vintage Character Port—While these Ports may sound like they are from a single vintage they are not! But they do try to taste like one. They’re really premium Ruby ports blended from very nice wines from several years. They’re matured in wood for about five years and are full bodied,rich in character and ready to drink. And they are a good value! Crusted Port—Now this Port is only made in small quantities and is hard to fine but I decided to include it anyway. 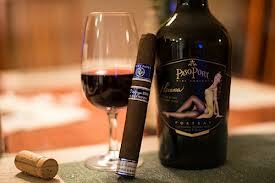 It’s a blended Port from several harvests that is bottled without filtering which causes sediment or crust to form. Crusted Ports are made from low volume or less quality grapes, but they’re still nice Ports that are more economical. The year on the label is the year it was bottled. Colheita Port – Ok now this gets tricky so pay attention. These are Tawny Ports from a single year which makes it different from an aged Tawny Port. They are aged in wood for years and are excellent but expensive. 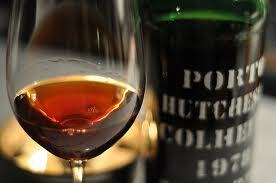 They are sometimes confused with Vintage Ports but instead of its age the vintage year is listed on the label. 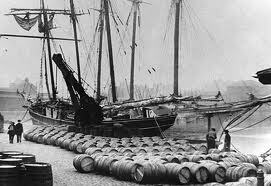 Colheita Ports may spend 20 years or more in a barrel before being bottled. They are also being produced as White Ports. White Ports – White ports are made from white grapes and range from dry to very sweet. They are often used as a mixer for cocktails, but older ones are served chilled as an aperitif. And if aged in wood for an extended time they darken and begin to resemble the color of their red grape cousins. Well I hope this clarifies ports… ok maybe not. But at least you will now have some basic knowledge when looking for a favorite Port after a wonderful dinner or as an aperitif. You also now understand why Talya was having trouble figuring out what would be a substitute for a Tawny Port in her recipe. And I Promise to Never Do Another Blog On Ports!!! Posted on March 13, 2013 by admin Posted in Uncategorized	. Posted on March 9, 2013 by admin Posted in Uncategorized	. Excuse Me But Can You Help Me Find A Port I Will Like? Good friend and fellow blogger Talya Boerner asked if I knew a substitute for a Tawny Port which more or less led me to write last week about how much I like Ports, and that as the Texas wine industry grows, it will become known for its Ports, especially those from Tempranillo and Texas Black Spanish grapes. I realize that while I can tell you how great Ports are, that really doesn’t help you determine the type you like. I’m talking about going to a wine shop and trying to sort through the different types of Ports, which in many ways can be very difficult. You see, one of the great things about Ports is that there’s one for all occasions and budgets, with different characteristics, aromas and richness of flavors. 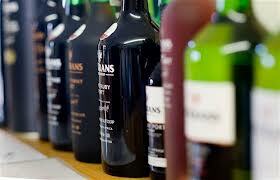 So you first have to understand the different types of port before you can begin your search for your perfect one! So I’ve decided to try to explain the different types of Ports hopefully in a way everyone will understand. So here goes! Now the first thing you need to know is that there are two different classifications for Ports. While all Ports have been aged somewhat in wood the difference is how they are allowed to mature, which is either in the bottle or the barrel. 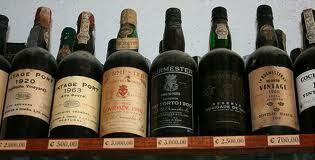 Bottled-matured Ports are usually smoother and less tannic. 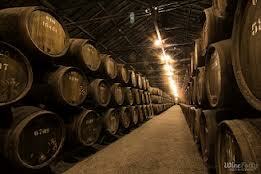 On the other hand barrel-matured Ports take on the color and taste of the oak barrels and are slightly more viscous. Now that you know that bit of trivia, let’s look at two of the top barrel-matured Ports. Ruby Ports—Young ports that are blended and aged in stainless steel, concrete containers or wood for two to five years. These ports are bottled while still deep ruby red and meant to drink immediately. They will not improve with age. They are fruity, fresh and often sweet. 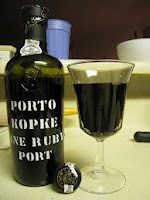 Ruby Ports are inexpensive, popular and a good introduction to Port. 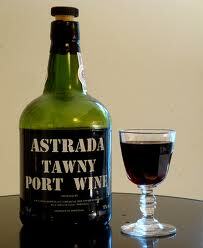 In fact, if you’re a first time Port drinker start with a Ruby Port! Tawny Part – Aged in wood between 5 and 50 years. They are blended wines with a golden brown color and slightly dryer with a hint of nutty flavor and aromas of butterscotch. They are the most versatile and work well as both an aperitifs or after dinner drink. Aged Tawny Ports or usually labeled 10, 20, 30 or 40 years and the older the better. Now let’s discuss two types of Bottle-matured Ports! 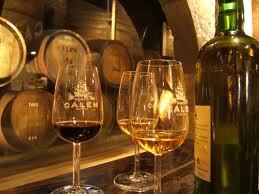 Vintage Port –Blended from the best wines of a single year and the best vineyards. They are kept in wood barrels for two or three years before bottling. They’re not usually ready to drink until they are about 20 years of age when they become a very smooth, elegant and mellow wine that is rich with great perfumes. They usually need to be decanted and are the most expensive of the Ports and most desirable with bouquets of coffee and cocoa combined with spices like pepper and cinnamon.. It’s also important to know that once opened a Vintage Port loses it flavor quickly and should be drunk within 24 hours of decanting. 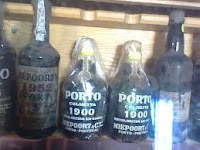 And “Vintage Porto” must be clearly marked on the label. Single-Quinta Vintage Port–Now these Ports come from a single vintage and estate, but are not good enough to be called a Vintage Port. Their grapes are from a single vineyard while a Vintage Port’s grapes are blends from the best vineyards. They’re kind of a marketing tool. They are made in good years but not from the best grapes, which allows wineries to expand their Port production by using their second level of wines to make a Single-Quinta Vintage Port. They’re not as good as Vintage Ports but close at half the price. And they will also need to be decanted before drinking. Both the Vintage ports and the Single-Quinta Ports need to be stored on their sides in cool places just like other fine red wines. More on Ports next weeks and then a promise to move on!!! The Neighborhood Wine Porch Party!!! 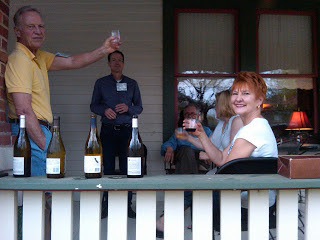 A Porch Party Spring…Cheers ! ! Posted on March 6, 2013 by admin Posted in Uncategorized	. Rosé The Perfect Wine For Barbecue And Outdoor Fun!! Everyday Wines For $10 Or Less! 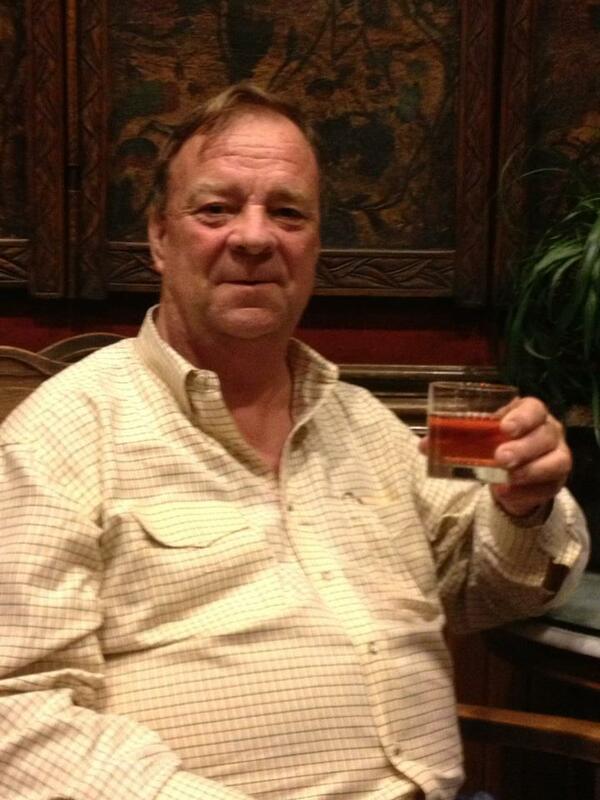 Zinfandels The Real American Red Wine! Wine Pairings With My Guide For Smoking Meat The Texas Way!